By browsing and utilizing our site you declare that you have read and understood our Data Protection Statement and that you agree with it. Our terms and conditions can be found here. The Lakewood Sonic System has been fitted to all our electro-acoustic guitars from 2005 until beginning of 2012. This system was the result of the co-operation of Martin Seeliger and Joe Marinic, who had the aim of dispensing with the routing cavity in the sides of a guitar. 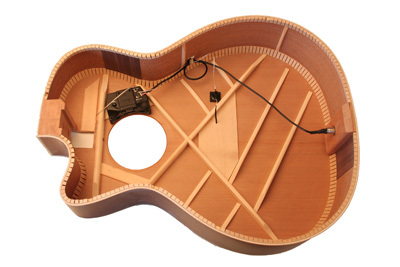 The idea was - at that time a new one - to mount the preamp of the pickup system in the soundhole of the guitar. It should still meet highest expectations in terms of ergonimics and tone, while offering a good range of sound varieties. The battery has been moved into the preamp, too. So there was no need for a separate battery pocket. 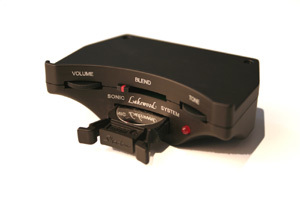 The result of the co-operation of Lakewood Guitars and Shadow Electronics was the Lakewood Sonic System, which works as dual system with two pickups. 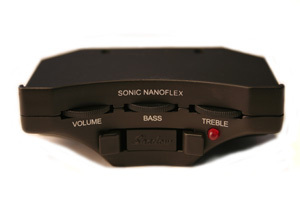 The "Nanoflex", developed by Shadow, picks up the sound of the strings at the bridge saddle. The transfer happens without any disturbing noises and pictures a very good dynamic range. The bridge pickup also senses the guitar top vibration in order to electrify the sound in a particularly natural way. There's a second pickup hidden inside the guitar. 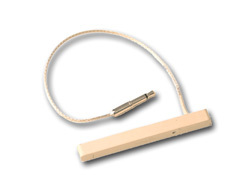 The "Nanomag" is a magnetic pickup and specialized to transfer a soft sound with round basses. The overall configuration of the pickup in the guitar has a good resistance against feedback and prevents those kinds of problems when playing at high volume levels. The signals of both transducers feed the compact electronics that sit in the sound hole, nicely hidden but still very well accessible for the player. Like on a high-end high-fi amplifier you will find only what you really need. Volume and upper frequency filter are pots. In the middle is the main control, the heart of the electronic. It is a fader that chooses either pickup in the end positions and gives you a variety of sounds in between when you mix the signals by moving it. A transparent acoustic sound can morph to a jazzy and warm tone. There’s actually no unpleasantly sounding setup or adjustments, because the system always respects the acoustic sound of the guitar in any situation. By launching this new system, cutting or routing into the sides of the guitar has become a matter of the past. The Sonic System is not available anymore through the Lakewood customshop. At the same time the Lakewood Classic System has been developed, which is particularly adapted to the needs of a nylon string guitar. 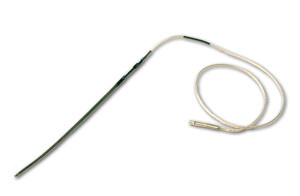 Since it is not possible to pick up a nylon string magnetically, the system works with the "Nanoflex" transducer only. The controls are positioned in the sound hole as well. 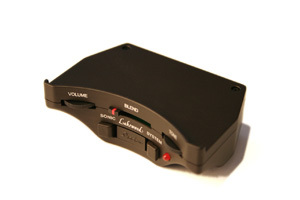 The pre-amp offers a volume control and two sound controls, which act in a high and a low frequency range. The result is an impressing nylon sound that possesses a remarkable transparency and awesome dynamics. Especially lovers of the Latin-American style will appreciate that uncomplicated system.As well as the Sonic System, the Classic System offers a simple battery change. The batteries are replaced just in a wink of an eye and the guitar is ready to go.The Lakewood Classic System fulfills the wishes that many guitarists have, a discreet but still efficiently working pickup system, that captures the original tone of the guitar and meets high quality expectations. 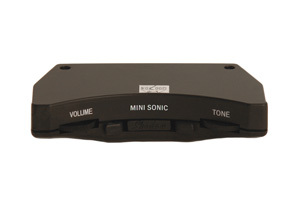 The Mini Sonic System was the simplified solution of the Lakewood Sonic System or the Classic System. It works with only one pickup, the Nanoflex under-saddle transducer.The control unit sits, as well as on the other systems, within the soundhole. It is slightly slimmer than the Lakewood Sonic System, though. Since there is only one lithium cell required, the "batterie drawer" is slimmer and thus enables the smaller case of the unit. That, of course, compliments the overall design.The adjustments are reduced to volume and tone control. The Mini Sonic System hasn't got a battery led and no phase switch.